Disgusting. I’m so sick of all this cashing in on what should be simplification. The Phila Inquirer had a bit about the local design school’s trashion show — clothes from shower curtains and magazine pages — the same weekend the silly NYT ran some ridiculous magazine blurb about eco fashion. Now I’m getting better about considering the total cost of food and clothing nowadays, but that doesn’t mean unbleached “green” cotton should cost thousands of dollars. How insulting! Anybody besides me sick to death of the commercialization and mass marketing of projects like this one we’re all in? 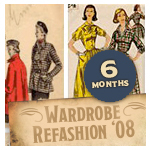 I first pledged the Wardrobe Refashion mantra Aug. 1, 2007, hoping to get through the Christmas season without buying new crap. Now it’s just a way of life that’s so second nature. I spend a lot of time thinking about crafting, and really, I should be using more of that time to exercise. But I love looking like noone else around, I love that I spend time making my clothes fit my body not the other way around and I love thumbing my nose at mass produced crap. I also love seeing the creative potential in everything around me. Who knew squash would be the belle of the ball? These baby pepper sprouts make me feel unsettled, as if I were looking at maggots or something equally icky. 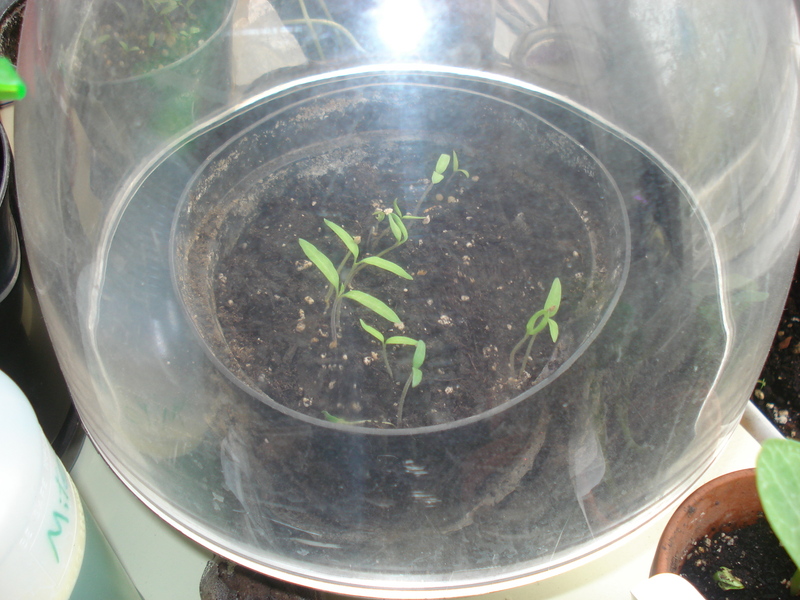 And heirloom tomatoes – a present from my Mister’s beermaking buddy – also are coming up in an old terrarium. My chamomile is popping up in the papaya pot, so tiny I almost missed it. Too tiny to photograph at this point — the seedlings all come out way too fuzzy. We’re going to garden on the Y axis this year, trying to plant up and down instead of covering all our shared yard with our pots. My Mister’s dad gave us a planter last year — a pole with a flat anchor that we placed in the bottom of a large terra cotta pot, weighted with a stone and filled with dirt to the top. Then threaded two smaller pots through their holes onto the pole, tilting one all the way right, and the next one all the way left. did the same for a small pot on the top, filling all with dirt. It looks something like this. I think we can buy a few more poles and some kind of anchor from plumbing supply, and string up more of our pots this way. Vertical gardening types believe the air circulation is better than planting flat on the X plane, and yields better, healthier plants. I’m more concerned with avoiding the irrational wrath of our sometime landlord. Plus, I want to grow as many edibles as we can in Chicago’s short growing season. Will post photos of the planting structure when the next one’s done. Will post tutorial, also. Will do all this and more once it stops threatening snow. I had a minor wardrobe meltdown this morning. Couldn’t find anything that worked. Granted, it wasn’t my usual office situation. I had to go to a writing conference full of people I’d never met, and I was riding my bike into the Loop instead of taking my car to the usual suburbs. Nothing fit quite right. Most skirts were out because I couldn’t find any plain black tights without any holes. Wide pants are too tricky to bike in. Finally I came up with something, but it irked me that despite a closet of clothes, nothing was right. I think there’s too much clutter in there, too many distractions that seem like feasible options but for some reason, aren’t. I’m going to an awards dinner tomorrow (Friday) night. A story I did at my last job – a piece I’m so proud of about notoriously and heartbreakingly corrupt suburban cops – is nominated among Chicago media. Sweet. But that same anxiety is kicking in – how do I look as proud as I feel, in bike-able gear? I thought all week about making a dress from black jersey I bought in Philadelphia and am crazy about. But I haven’t been able to make anything right lately, and I’m so scared of ruining this chunk of fabric. My Minna top zipper broke so I’m going to have to redo it (no, it won’t repair. already tried that). And I made up a cute cap mockup in scrap denim but it was too small. Tried to do it again, paying closer attention to the pattern, but the second one turned out too small too. I’m scared of spending precious free time on projects that will leave me more frustrated than when they were still optimistic possibilities. Maybe it’s just one of those nights. My Mister’s sister is crazy for pink. I suspect it’s to prove her tacit credos that redheads can wear whatever they like, and so can tough broads. She also teaches at a Chicago Public School, and hates mixing her ‘normal’ wardrobe with her teacher clothes. So she has a sort of double wardrobe. I don’t know where this vintage handmade blouse will end up, but I spotted it at a suburban Salvy and plunked down the $.75, thinking if she doesn’t like it, she’ll donate it back. Or she’ll hand it back and we’ll put it up for a few $ on etsy. It has a wide, trapeze shape, and the sleeves were sewn on in three pieces. Plus, the pink circles are mesmerizing. I had to repair the sleeve and bottom hems. Card by Rar Rar Press, Chicago. My mister has a fantastic auburn stash growing under his nose. And I have a fabric stash growing under a terrarium (it sits atop a bookcase, stuffed with folded fabric). Totally just added to it. 70 degree weather (!) inspires all kinds of growing. And whenever the Joann has a 50% off the clearance fabrics sale, I totally stock up on basics and stuff for baby gifts. Some sewers advocate a five yard minimum when buying fabric for unknown purposes, but I’m more of a two-yard sewer. I don’t wear big dresses or full skirts, so two yards – esp. 60-inch fabric- is usually enough for pants, A-line skirts and most tops for me. Too bad they didn’t have any plain denim. I’ve been itching to make a warm weather denim wrap dress using the BurdaStyle Desira pattern I’d lengthen like this one I already made for my favorite little girl. Weird white cotton with red print of pheasants and old-timey looking couples. Will line something. Or turn into a blouse. Gray lightweight twill for a Desira wrap dress. Wine colored polished cotton. Some kind of summer dress. Brown cotton with subtle black stripes and little dots for a spring top – the Ellinor Sew Along with Nikkishell. Eggplant crepe backed satin. I really have a purple dress problem. Also bought this McCall’s pattern because of the hats. I’ve been wanting to use two angora sweaters I managed to shrink to copy my favorite Kangol furgora jeff cap but have had zero luck finding a pattern. This little cap (E) is sweet and close enough for now. Will try it out using a chunk of heavy denim from this Freecycled bag of scraps. Anyone know where to find great hat patterns? The sun has shown its face in Chicago after a dreadful winter. Time to think again about the Growing. Couldn’t do it before – it was way too depressing to think about green stuff when it was still so far away. Sunday Tribune claims it’s warm enough to start growing greens – spinach, arugula (rocket), and the heavy lifters – kale, collards and all. O happy day! Last Saturday, while it SNOWED and SLEETED, I fired up the old pots and planted. By this past Saturday, teeny seedlings were up and flourishing in their starter homes. Basil in a glass pickle jar. Cherry tomatoes in plastic pretzel jars. Heirloom tomatoes in a small terrarium. 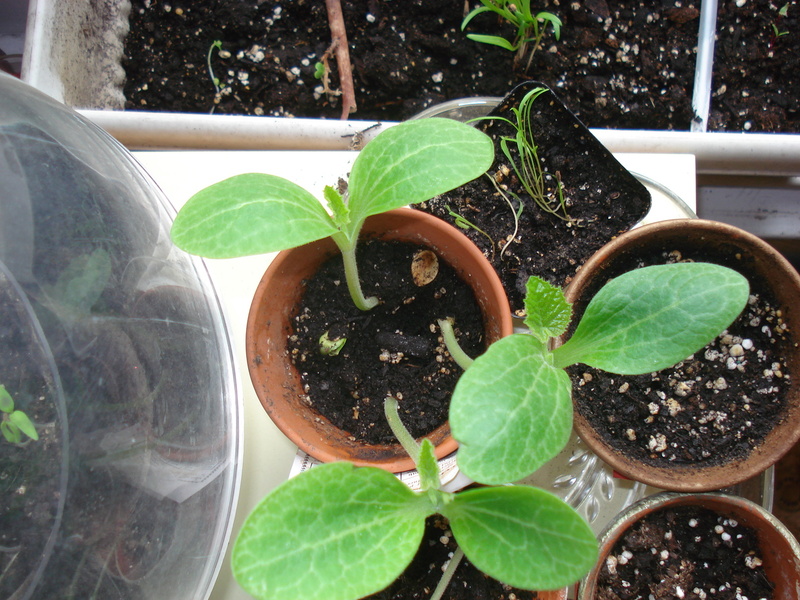 Squash, zucchini, sunflowers and cucumbers in little terra cotta pots. Squash already looks strong enough to choke me in my sleep. Spinach, mustards, spinach mustards and beets in a long window box. Dill, lettuce and cress in whatever was left. 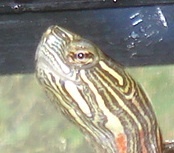 I *know* it’s a while still before the plants – save the greens – can go outside. Gives us time to master hypertufa crafting so the bigger stuff will have containers to grow. And our mamas will enjoy homemade Mother’s Day fare. And I *know* we only have containers to plant in our shared Chicago backyard. But those mama gifts will need filling, too.